Abstract: Diamond has many material qualities that make it attractive for the diverse palette of nanoscale science and engineering systems1. One exciting application that lies at the forefront of diamond research lies in quantum science. Non-classical (single photon) light sources based on individual color centers in diamond, most notably the Nitrogen-Vacancy (NV) color center, have been used for communication via quantum cryptography protocols. The NV color center spin has also been used in applications ranging from quantum computing to magnetometry. In any case, practical implementations will require efficient excitation and extraction of single photons from an NV center. This is a challenge for bulk diamond crystals due to the high-refractive index of the host crystal, so that the majority of emitted photons are not accessible even to sophisticated set-ups. Diamond nanophotonic devices offer a solution by interfacing an atomic scale color center with a macroscopic optical system. Moreover, scalable manufacturing of these devices could allow us to optically address and read-out many quantum systems in parallel. In this talk we will start with an overview of diamond nanophotonics with emphasis on proposals for developing integrated devices that contain a single color center. We will then describe our recent major result2-3, which is the design, fabrication, and characterization of the diamond nanowire single photon antenna. This device consists of a single NV center embedded in a top-down fabricated diamond nanowire. We observe that the presence of the diamond nanowire modifies the emission pattern of the NV center favorably compared to a bulk crystal, which allows us to extract ~10X more single photons at ~10X lower pump power. Finally, we will discuss a new approach to this device that utilizes ion implantation of single NV centers into devices fabricated from ultra-pure diamond4. This allows us to improve the purity of the single photon source, so that we are able to reduce multiphoton probability by ~3-5X while maintaining high single photon flux. Finally, we conclude with an outlook for further engineering of the optical properties of the NV center in diamond photonic devices. Biography: Tom Babinec received a B.S. in physics and mathematics from The University of Michigan in 2007 and a M.S. degree in applied physics from Harvard University in 2010. He is currently working towards a Ph.D. in applied physics in the Laboratory for Nanoscale Optics at Harvard University with Professor Marko Lončar. In 2007 he was awarded a National Defense Science and Engineering Graduate fellowship in physics as well the National Science Foundation Graduate student fellowship in materials science. 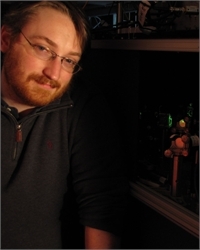 His research activities and interests focus on nanoscale optics and photonics as well as nanotechnology in general.